IT WAS funny but not really. It was funny but not at the time! I was on my way to help out a single mom, and got stuck in a ditch. I wonder how many times this has happened to you? You set out to do good and run into a snag, a snafu, a little bit of trouble. You want to help. You want to be of assistance but you can’t even get to them before you fall in the ditch. 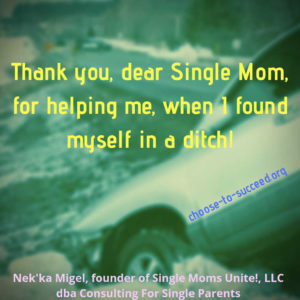 And then the single mom helps me out of the ditch! Wow! What an amazing thing! I’ll tell you what; leave it to a single mom to not only get me out of a ditch but to have the know-how to get me out. Seriously folks, my tires were spinning and spinning trying to drive up out of this ditch before dear single mom came to my rescue. So thank you so much, Dear Single Moms, for all that you do for your families, for other people and at the same time managed to keep your wits about you. And a big THANK YOU to the dear single mom who helped me out of a ditch, tonight.